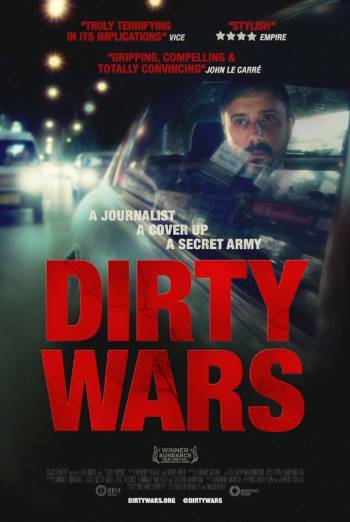 DIRTY WARS is a documentary following war reporter and journalist Jeremy Scahill as he investigates the expansion of America's war on terror through the use of covert special forces. A sequence of mobile phone footage shows the fatal injuries suffered by victims of a night raid on a small village in Afghanistan, which includes some close shots of bullet holes in men's blood stained torsos. In other scenes there is sight of blood on the arms and hands of a man injured after a minibus is hit by a bomb, sight of wounds on a man's torso, dead bodies shrouded in bloody sheets, as well as sight of dead bodies including young children and a baby who is held up for the camera. The film also contains some verbal references to the killing of civilian pregnant women and children and to bullets being dug out of the dead bodies.